As for the instrument, the harpsichord is very different from the grand piano. What is most obvious is action - the strings are not struck by hammers, but plucked by quills. So, it was natural to first focus on this aspect. Wanda Landowska put drawing pins in her grand piano in order to check out what kind of sound the harpsichord had. 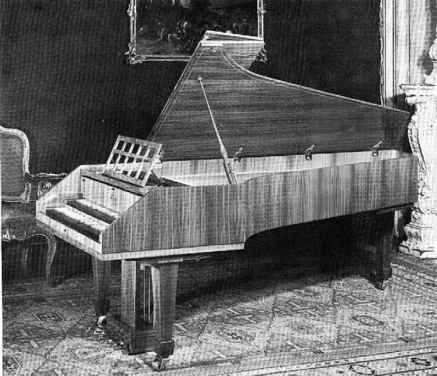 In 1911 she managed to convince the Pleyel company to produce a harpsichord with real plucking action for her, the first produced in over 100 years. That great artist made wonders with it, which we can still enjoy on records, though nobody would say today that it was a harpsichord she was playing. Another difference between the grand piano and the harpsichord is not as obvious as action: In the modern piano very strong steel strings are mounted in a metal frame under immense tension - 17,000 kg for one instrument. By the nut, the strings are connected to the soundboard, which obviously has to be very strong too, being made of laminated wood, having considerable thickness and impressive barring. The bottom of the instrument is open, so there is no air resonance at all. The bottom of the historical harpsichord, on the contrary, is closed, providing for a powerful air resonance. The soundboard is of very thin spruce -down to 1.5 mm along the edges for a board 1 m wide and 2.5 m long. This, of course, cannot support high string tension or heavy stringing. Fig. 6.13: The modern harpsichord, a 175 kg piece from around I960 by the Sperrhake industry in Passau, Bavaria. Production of historical harpsichords ceased by 1800. When they were produced again it was done by adding plucking action to an instrument that essentially was a variant of the modern grand piano. The sound of these huge instruments, however, was weak, and the action heavier than on the modern grand. The historical articulations described by for instance Carl Philipp Emmanuel Bach were literally impossible to use on these neo-historical instruments. exactly plane, so in this respect the modern instrument should look more beautiful. As a matter of fact special double pinning techniques had been used to keep the strings aloof from the soundboard of the historical harpsichord when, not if, it got buckled due to seasonally changing air humidity. Accordingly, the new manufacturers used the same type of soundboard as for the grand piano, also provided with an impressive barring beneath, and then, of course, the dimensions and the tension of the strings had to be in proportion. Fig. 6.14: Historical harpsichord copy by the Boston masters Hubbard and Dowd. 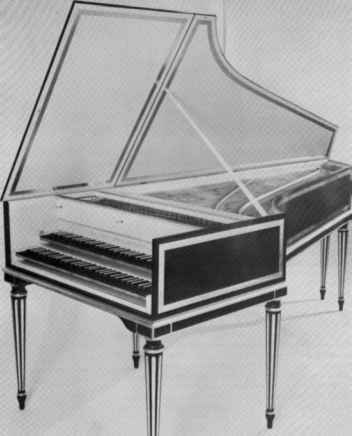 In 1965 Frank Hubbard at Harvard University published a treatise on the historical design and making of harpsichords. 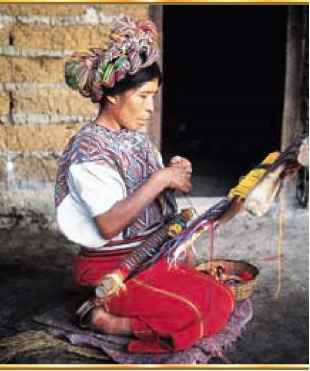 Hubbard in a unique way joined academic scholarship with practical artisanship. He founded a firm in Boston that produced not only harpsichords but also harpsichord kits. The ingenious idea was to use industrial techniques for such mechanically repetitive work as assembling the case, making the stand and lid and sawing out the keys. The really work intensive fine adjustments were left the customers, who could thus, using their own working time, get a fine instrument at less than half the cost of a finished one. A whole generation of harpsichord makers got their first training assembling Hubbard kits, and the design was eventually forced on that part of the industry that managed to survive. The problem was with the plucking action. As this was what distinguished the harpsichord, it could not be dispensed with. In the historical instruments quill had been used, but such a pluck would almost not be audible. So, particularly hard, tanned leather was used for the plectra. Nevertheless, the energy supplied in this way was much smaller than that produced by a striking hammer. The sound produced therefore was very weak. Accordingly, several registers were added, some with strings as thick as pencils, but then the framing had to be strengthened even more, and the sound hardly became any louder. Some people became accustomed to this kind of sound, assumed that this was the way music with historical instruments should sound, and decided to like it. Others, such as the famous conductor, who never admitted any harpsichord to his concerts, and who described its sound as that of "skeletons copulating on a tin roof", dismissed the entire early music movement as rubbish. A particular disadvantage was that with all those registers action became very heavy. The harpsichordists had to develop strong fists and strong fingers which would work with perfection no matter how unreliable the action was, because the keyboard player is at the disadvantage, compared to other instrumentalists who carry their own instruments along, of having to accept whatever the venue happened to be equipped with. "I realized... that to dominate the excessively heavy action ..., I must cultivate a piledriver strength and a total independence in all ten fingers. I knew that this technique had little to do with the indications furnished by 18th Century source material... It had, and still has, aspects that I have always considered profoundly unmusical. Nevertheless, I embarked on years of finger exercises, designed to cultivate an ability to get even the most resistant keys down with a steely precision. Those years of finger exercises, after all, have stood me in good stead... At the end of a summer vacation involving heavy gardening and shovelling of dirt... I always found that two weeks would be sufficient to put me back in shape. I remember one occasion in 1967 when I was just about to complete ... a terrace, a telephone call came ... asking me to play the Fifth Brandenburg with Karajan two weeks later ... although I never did finish the terrace, I was not the least worried about the state of my hands. My reaction when confronting those keyboard players who... never shake hands is to bring the conversation around to the carrying of baggage ..., the cutting of firewood and so forth. With the arrival on the scene by Hubbard... there began what for me was a joyful period; but it began too late. I now discovered new resources for playing and I enjoyed the privilege of bringing out the beauties of an instrument rather than being obliged conceal its defects." This situation was really absurd, because the old treatises on harpsichord playing describe practices which are only possible with an extremely easy and reliable keyboard action, being impossible even with a modern grand of the highest quality. In this way the instrument literally blocked the way to regain the historical way of playing it. The story could be told similarly for all the revived historical instruments. Thurston Dart in his pathbreaking book "The Interpretation of Music" 1954 coined the nicknames "pianochord" (for the piano-harpsichord), "luthar" (for the lute-guitar), and "cellamba" (for the cello-viol/viola da gamba). His verdict was that those instruments bore almost no resemblance at all to the historical harpsichords, lutes, and viols, and that they effectively blocked the way to historical performance.